Ella Chadwick is only 11 years old but she is already inspiring young men and women around the globe with her courage in battling a rare kidney disease that she was born with. She said she likes working on the "hundreds" of cards and that the patients love them, but she had no idea what was in store for her on this trip. "She didn’t have a clue he was going to be there," her mother, Karen Hughes, told "Good Morning America." "He just surprised me and I thought, 'Woah, this is a dream!'" Ella told "GMA." "I couldn’t believe it. I was so happy. I was about to scream!" she said. "I felt really proud of myself. I want to say a big thank you for David Beckham. I love you so much!" She also said that the former England captain gave her a hug — one that he described as "the best hug ever." "He was just talking about his little girl with Ella because Ella was making cards full of glitter, and he said it was like being at home with his daughter," Hughes told "GMA." 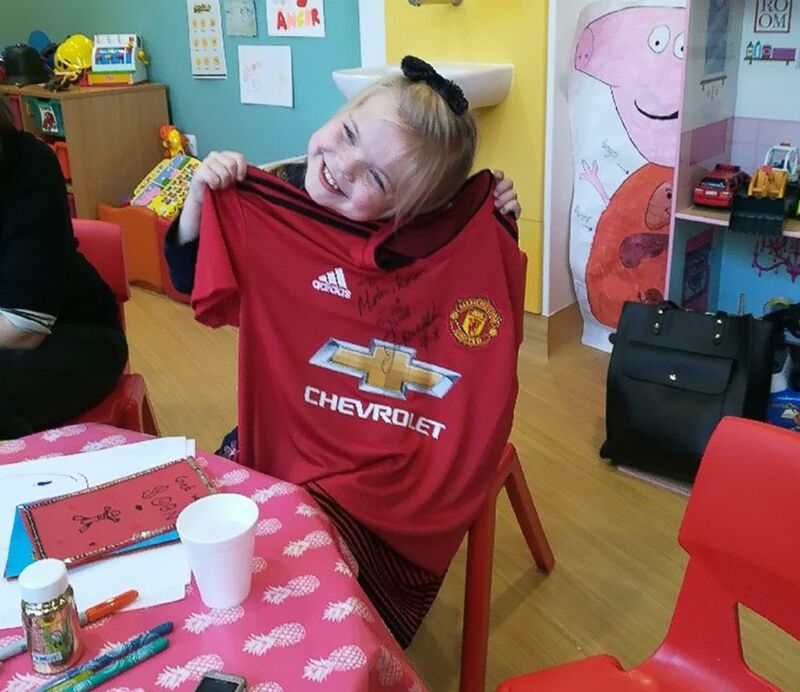 Ella Chadwick had a dream come true when soccer star David Beckham visited her at Great Ormond Street Hospital in London. "When I was a little baby, I used to have kidney problems," Ella said. She had to go through six years of dialysis. "Her dad donated a kidney when she was 3 years old, but she suffered a blood clot just hours later, so it had to be removed," Hughes told "GMA." "After the first transplant failed, tests were started a year later to attempt the transplant again, but tests showed a transplant couldn't be done because her arteries were all too small to plumb a kidney to." "We were hoping over time they would grow bigger, but due to problems trying to do dialysis, we were told nothing else could be done, and she just had days left," Hughes said. "Luckily another surgeon got Ella [the] transplant, and thankfully, Ella got her kidney from her Nana," Hughes added. Ella had her second transplant in May 2014. I’ve got through all those dark times because of her and that amazing smile. I’m the proudest mum of the most amazing girl ever. "She’s full of energy," she said. "It’s what amazes me about her — with everything she’s been through that she’s still so full of life. But I think it’s because she knows what it’s like to feel awful. She just wants to help and make people smile because she knows what it’s like to be in a hospital." At the Pride of Britain Awards, the "X Factor" judges Simon Cowell, Robbie Williams and Ayda Field presented Chadwick with her award. She was over the moon when asked to sing for the audience at the show. "I couldn’t believe that I got to sing for Simon Cowell. In front of everybody. And they said you’re gonna get a ticket. He let me in!" she said. "It was lovely to see Ella looking so well following her kidney transplant here. She is still the happy, cheeky character we remember from just a few years ago," Lynsey Steele, a play specialist from the hospital who worked with Chadwick, shared. "We’re so proud of her for all the support she gave to the other renal patients on the day with her generous get well cards. What a lovely treat for them all!" "She makes me proud every single day," Hughes wrote. "I’ve got through all those dark times because of her and that amazing smile. I'm the proudest mum of the most amazing girl ever."